Ididn't go on the most recent Oakland Urban Paths walk earlier this month, but there's a nice write-up of the Rockridge Ramble by OUP founder Paul Rosenbloom. I did do the test walk with Paul, where we noted the non-matching sidewalk stamps and street signs, at what is now the corner of Romany Road and Golden Gate Avenue. The names stamped in the sidewalk are McAdam St. and Hays Ave., and a nearby contractor stamp is dated 1913. But when were the streets first created? When did they change names? 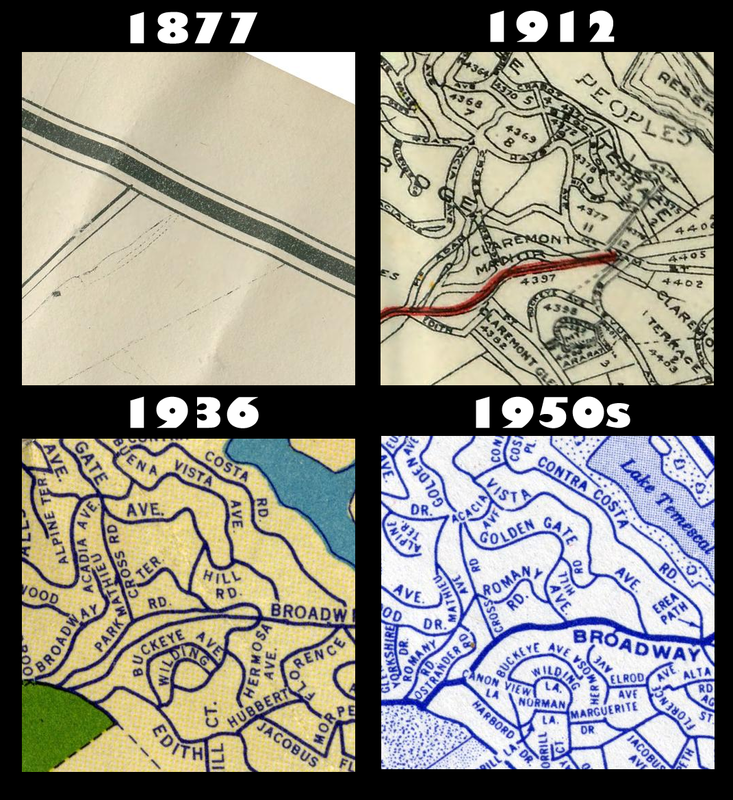 Examining the great set of historic maps of Oakland at teczno.com, we can learn a few things. McAdam Street is on the 1877 map, and started at "Broadway Street" near where the Safeway is now, and went through land owned by H.P. Livermore. It's not clear how far the street actually went, since on the map the upper part is drawn as a perfectly straight line, which is unlikely given the hills. Between 1877 and 1912, there was clearly a whole lot of building going on. The 1912 map shows McAdam Street with a different, curvier route, and Hays Avenue, along with a whole lot of other streets that weren't on the earlier map. The 1936 map shows McAdam Street is now Broadway Terrace, and Hays Avenue is now Golden Gate Avenue. It's possible the labeling as Broadway Terrace is an error, because there's a road in the current location of Broadway Terrace on the map with no label on the nearby section. Finally, the 1950s map shows the present names, Romany Road and Golden Gate Avenue, as do the 1967 map and the current day maps. I'm fairly confident that the old name for Golden Gate Ave. is Hays rather than Havs. Check out the Assessor's map here: http://www.acgov.org/ms/prop/maps/BK048A/48A7105.02.PDF . It was mentioned that McAdams is now Broadway terrace, but it seems like McAdams is today's Pleasant Valley Ave. Would you confirm that please? It was both, sort of :-) The lower part on the 1877 map is near where Pleasant Valley meets Broadway in present day, and the 1912 shows an upper and lower section. The 1936 map shows the upper section gone, but the lower section still there. I think that lower section went away completely, as in the 1967 map the new Pleasant Valley Avenue lines up with 51st Street as it does today. All of the other maps (except 1936) show McAdam part way between 50th and 51st. It's hard to be 100% certain, because of different errors in the maps, not to mention possible errors in lining up and possible errors in my reading them.